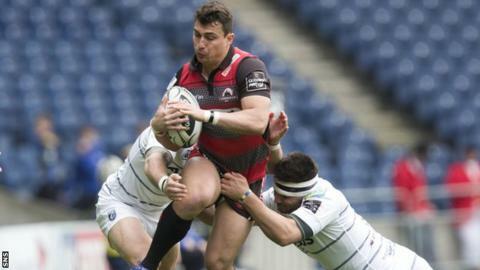 Edinburgh's season ended with a whimper as they surrendered a 10-point lead, losing 21-17 to Cardiff Blues and finishing ninth in the Pro12 standings. Defeat to Munster last week all-but ended the hosts' European Champions Cup hopes, but first-half tries from Hamish Watson, Matt Scott and Tom Brown provided some cheer. Rey Lee-Lo replied for the Blues, who powered back after the break with Cam Dolan and Garyn Smith touching down. With loanee fly-half Jason Tovey prowling the gain-line, Edinburgh's juggernauts - Rory Sutherland, Stuart McInally, Nasi Manu - could pick their lines and puncture the Blues midfield in the early exchanges. Watson was sent in at the corner for his fifth try of the season by a basketball offload from Cornell du Preez, after he sucked in two Blues defenders. Tovey's conversion hit the post, but he bisected the uprights six minutes later when Gloucester-bound Scott, in his last game for the club, scooped up quickly-recycled ball from Damien Hoyland's break to ground from four metres. Anton Bresler and his beefy colleagues were bullying the Blues carriers in the close-quarter collisions, and particularly in the scrummage, the Welsh side only able to show flashes of their trademark high-tempo rugby. When they did construct phases, earning quick ball in the Edinburgh 22, they scored, Lee-Lo using footwork then brawn to stride through a stretched defence, Gareth Anscombe converting. But the Blues were bludgeoned off the ball on their own 22, the hosts surging into the ruck, spoiling and scrapping to emerge with possession. Scott grubbered in behind, toed the bobbling ball to the whitewash, and generously left Brown to fall on it as it crossed the line. Again, Tovey hit the woodwork from the tee, but Edinburgh held a 10-point half-time lead. Smith came painfully close to a second Blues try after the break, thwarted at the corner flag with Brown and Scott scrambling across to haul him into touch-in-goal. But with the Blues utterly dominant, the hulking Dolan galloped onto Ellis Jenkins neat offload to score, before Smith himself finished Dan Fish's slaloming broken-field break, Anscombe converting both. Edinburgh are getting better, though the grumblings over Alan Solomons' pragmatic, structured and - as a consequence - at times exceptionally dull rugby persist. The absence of a controlling pivot like Tovey to drive the play and bridge the gap between the bruisers up-front who win the ball, and rapiers like Hoyland who need it, in space, to score, has been punitive. The mantra in these parts is progress, but this loss consigns them to ninth spot, one berth lower than in the two previous campaigns, albeit having racked up a comfortably superior points tally. And while young Scots are now thriving across the capital side, where Solomons has assembled among the fiercest packs and meanest defences in the league, a season that promised much ends with Edinburgh pondering how best to exploit their brawn, and reflecting again on another failed bid for Champions Cup rugby. Edinburgh: Fife, Hoyland, Scott, Strauss, Brown, Tovey, Kennedy, Sutherland, Ford, Nel, Bresler, B Toolis, Manu, Watson, Du Preez. Replacements: McInally, Dell, Andress, A Toolis, Bradbury, Hidalgo-Clyne, Dean, Helu. Cardiff Blues: Fish, Summerhill, Smith, Lee-Lo, James, Anscombe, Williams, Jenkins, Rees, Filise, Dolan, Down, Turnbull, Jenkins, Navidi. Replacements: Dacey, Thyer, Andrews, Reed, Cook, Williams, J Evans, G Evans.